This plant can be grown easily in most places with the exception of areas that have extremely hot climates. The ideal conditions for growing this gem of a plant are moist and cool summers, and mild winters. Artichokes are often described as being gourmet vegetables due to their ball-like flower heads and their delicate flavor; the heads are best picked and eaten before they have the chance to bloom. Artichokes can be grown from seed, but this is a long and extensive process; it is therefore advisable to start with ready-rooted suckers; these should be planted in the spring. Artichoke plants can grow up to five feet (one and a half metres) high and reach a width of over three feet (one metre). They carry a huge clamp of jagged, arching silvery glaucous-green leaves. 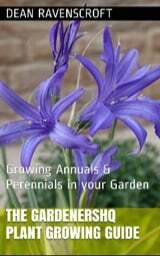 As each plant produces up to 12 edible heads one plant may be enough to meet a household’s needs, however many will prefer to grow a few plants and they can also easily be grown in groups if you have the space. If growing more than one plant then sow/plant artichokes a distance of two feet (60 cm) apart, and about two and a half feet (75 cm) between rows. The most important step one needs to consider when growing Artichokes is finding the right place for them to grow – a well-drained soil, in an open sunny spot. The architectural make up of artichokes means that the plants are suited for the back of a border. In order to improve drainage, add horticultural grit to clay soil and supply plenty of well-rotted manure to the planting site so that the soil becomes rich and fertile. Raking in some general fertilizer will also be beneficial for artichoke plants. This should be spread at a concentration of 60 grams per square meter before planting. In zones or locations where Artichokes are grown as perennials, one should select a site that can hold the plant for up to five years or so. Since mature artichokes can be three to four feet wide, and four to five feet tall, give them enough room to spread and grow. Dig a hole that is bigger than the plant and sucker in order for the soil mark on the stem to be at the same level as the surface of the soil. Ensure the plant is held firmly when filling the hole with soil, and water well. Artichokes flourish in partial shade to full sun. They need well drained soil (loam or sandy is ideal), light and about the right soil fertility. Prepare the soil by adding five inches of compost into an eight inch deep trench with equal width (adjust hole depth based upon soil mark on the sucker). Plant artichoke seedlings on top of the amended soil, and space them at a distance of around four feet (120 cm) apart in warm climates. In colder places, such as in zones 6, plant artichokes closer to each other, at a distance of two to three feet (90 cm) apart, since frost can hinder the plant from reaching a fully developed, mature size. The two main reasons why the planting of artichokes can fail are summer droughts, and waterlogged winter soils. The addition of compost can help to improve the soil’s ability to drain water in winter, and to retain it in the summer. Keep plants well hydrated especially during hot weather, ensuring that they do not dry out. In autumn, cut back stems, and then apply a thick mulch of bark chippings (or other materials) to protect the crown for the forthcoming during winter season. Adding a mulch of well-rotten manure during early spring can help boost the plant’s growth. In cooler growing areas, give plants a thick mulch with the use of organic materials such as aged manure, straw, dry grass clipping, or a mixture of these. Always safeguard artichoke beds by keeping the weeds out. Remove mulch once the buds begin to form and place a thick layer of compost around every plant extending 12 inches outwards from plant’s base. 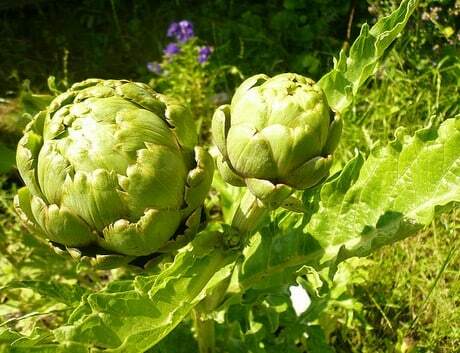 Due to the fact that the harvest increases as the plant ages, it is best to over-winter artichoke plants. For warmer zones such as zone 8, cut artichokes back to slightly below ground level after the autumn/fall harvest. Cover with three to four inches (7-10 cm) of organic mulch including shredded leaves or straw. For zones 6 to 7, mound organic mulch over the plants after cutting back to roughly 12 inches (30 cm) tall. Cover the plants and mulch with the use of an inverted bushel basket. It is advisable to use compost as the first mulch protection then other organic layers of mulch such as shredded leaves and straw around and over the bushel basket. Dress the plant with a rainproof cover over the mound. Artichokes can encounter problems such as botrytis blight, which can coat older leaves, and slugs that attack young foliage. Treat the plant with the use of neem oil or other fungicide, and if only a few leaves are infected, remove and destroy them. During its first year, perennial artichokes need to have all of their energy put towards vegetative growth in order for them to grow lusciously in the future, so make sure to remove any flower heads as they form. In the second year, edible heads should be allowed to develop in readiness for the summer harvest. Always pick the bud (edible bud) that is on top first, when it is already swollen and large, but before the scales have started to open. Harvest buds that are tight and firm and at least three inches in diameter. 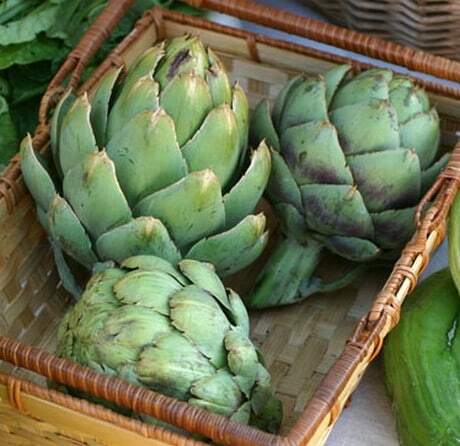 Artichokes with opening buds lose their tenderness, and those that have fully open buds are not edible. Artichokes at the Market by La Grande Farmers' Market.